Like a blog within a blog, so too are the days of our lives. It's been one year since I started this blog by simply "paying tribute" to the title of my favorite album by the Fall, dropping my name in front of it, and writing about stuff that interests me. OK, I'm lying. It was really just for me. I hadn't been doing as much stand-up in recent times - it seems kind of "undignified" once you become a person of a certain age - and needed a new venue in which to vent, tell jokes, and comment on stuff. "This site is for people like me, who love and hate the media in equal measure but can't stop consuming it, who are fascinated by how journalists, PR people, and advertisers work together or don't work together to make the media landscape what it is today, and who love to pick it apart piece by piece." I'd say that's still about right, though the word "hate" is probably too strong a word (but it does work for one of my favorite local sites, Winnipeg: Love and Hate). I will admit to rubbing my hands together with glee at the local media war that was recently launched by the Winnipeg Free Press, mostly because of how silly it is for traditional media to be taking potshots at one another when their larger problem is that information belongs to everyone now - for free - regardless of who found it first. I'm not saying that it's right, just that it's so. I started this blog slowly - just four, lousy posts last September - unsure whether I'd have the time to stick with it, enjoy it, find an audience, or alienate those closest to me, as any would-be comic, teacher, or commentator is wont to do. I also wasn't sure if blogging would be a good or bad thing, being a college instructor. I'd hidden my Facebook profile because being "Facebook friends" with some students in the class and not others didn't sit well with me. And every instructor knows that his or her actions and words can be misconstrued at the best of times. For instance: anyone who's ever been a student knows that a teacher with a beer in his or her hand is, by definition, an alcoholic. Pass it on. Nonetheless, I saw the worthwhile applications for blogging in the world of ad and PR, and noticed that more and more of my freelance clients wanted to set up and write blogs in conjunction with their existing social-media efforts. So, I went with the stealth approach to test the waters: "secretly" blogging and tracking the hits with StatCounter. In a year's time, I went from getting just one page view a day (I admit: it was me! Ha, ha!) to a lifetime high of just over 4,000 the day that another, way more popular website linked to one of my extremely rare sports blogs. Slowly but surely, I noticed that I was getting e-mails, comments, and feedback not just from friends and family, but "strangers" who actually found an article I wrote through Google, Amazon, or an RSS feed, including "famous people" like ad guru Roger von Oech, my favorite YouTube vlogger Katz20two, and RRC president Jeff Zabudsky, a blogger himself. For me, the most rewarding aspect of blogging isn't the number of page views, it's being part of this vibrant local, national, and international blogging community in the fields of advertising, PR, politics, media watching and critiques, education, news, and (ha!) sci-fi collectibles. My favorite local blogs: PolicyFrog, Progressive Winnipeg, ChrisD (a nice guy who I was happy to meet in person at the Bothwell Cheese airport launch), Winnipeg: Love and Hate, Message Communications, the Rise and Sprawl, not to mention CreComm grad blogs World of Wade and Vadebonk-isms. I've been ruminating on a workable online news model for some time, and these thoughtful and eloquent folks have helped me visualize how that might work. As a result, one of the first orders of business for this year's first-year Creative Communications PR students will be to set up a "professional blogging network" of their own, with some advice from a roundtable of local bloggers in the second week of school, featuring some of the famous local bloggers named above. It should be an interesting discussion, and just cool to see some of my favorite "online people" in a room together. Once the student blogs are set up, I'll link to them through the blogroll on the right of this page, and we'll see how our little experiment progresses and grows (or regresses and dies, as the case may be). I know that when I ask 35 students to "move the chairs out of the way," it happens in about two seconds. Imagine the communication and reporting possibilities - which is almost exactly like moving chairs out of the way, only better. Lastly, as I did one year go, I encourage anyone interested in the advertising, PR, journalism, and broadcast industries to look into Red River College's Creative Communications program. If you think you'd like to do this stuff full time, it's the best place to be - I say that as an instructor and graduate of the program. The college gives preference to Manitoba applicants, though it's not unusual for us to have out-of-province and international students. There's a waiting list to get in - the earlier you can apply, the better. And, oh yeah: thanks for reading. I'm not really sure what the readership was like on the Ad majors blog, Ad Apocalypse, last year, but I've found that I have a relatively small dedicated readership of my own since starting my blog back in April. It helps that I try to deliver a fairly steady amount of posts, though I'm nowhere near as prolific as you, Kenton. I signed up for Stat Counter after you posted about it back in May or June, and log in and check my readership every day. It's usually around 20-30 people a day with spikes depending on what I've blogged about on a given day. I've had viewers from all over the world, but most are short visits based on key words that led them there. All in all, I think the individual blog assignment sounds like a good one and it will be interesting to see what develops. I like the idea of a blogging community, because it's built in readership for these young bloggers. It's easy to think "Who actually reads this?" when you don't get comments, but even really successful blogs don't get a lot of comments sometimes. It seems like every blogger doubts themself at one time or another. The assignment will also help students measure their blog against others and see where they can improve and where they're excelling. 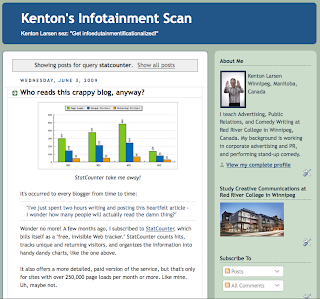 Happy blogging everyone, and Happy Anniversary Kenton! Thanks, Wade. I'm enjoying your blog very much. I don't know of any blog networking experiments out there, other than what Jeff Jarvis is doing at CUNY - but I'm open to comments and ideas from anyone who may have a tip or two about how to make it work. Otherwise, we shall see what happens. What do you think: should ad majors have their own blogs, or just one for the entire class? I think having their own blog is better because it puts more of an onus on them. Last year's group blog worked well in some respects, but it often didn't result in any kind of dialogue being established. Some posts received a couple of comments, but most seemed to go unnoticed. By giving the blog assignment individually you're giving it higher consideration. You're not only encouraging the students to get more involved in their own blogging but also to start looking at more blogs that are out there. You may want to include parameters in the assignment such as having a blogroll that includes other students' blogs as well as "professional" blogs. This will not only encourage the students to look at other blogs, it can often help them in guiding their own (I often find that reading other blog posts has a way of jump starting my own train of thought). You may also want to encourage them to visit and contribute comments to each others' blogs. You could make it part of the grading system for the assignment, although that would create far more work for you to check up on. Perhaps you could just present it as part of the marking criteria while not actually adhering to it unless people are really not contributing to other blogs. I'm quite interested in this assignment, Kenton. Any chance you could email me the handout so I could check it out (and maybe provide some additional feedback)? You bet: I've got the assignment all written up and everything. We'll be in touch!